I’m not really sure where to start with these. They are, by far, the coolest cupcakes I’ve ever made! 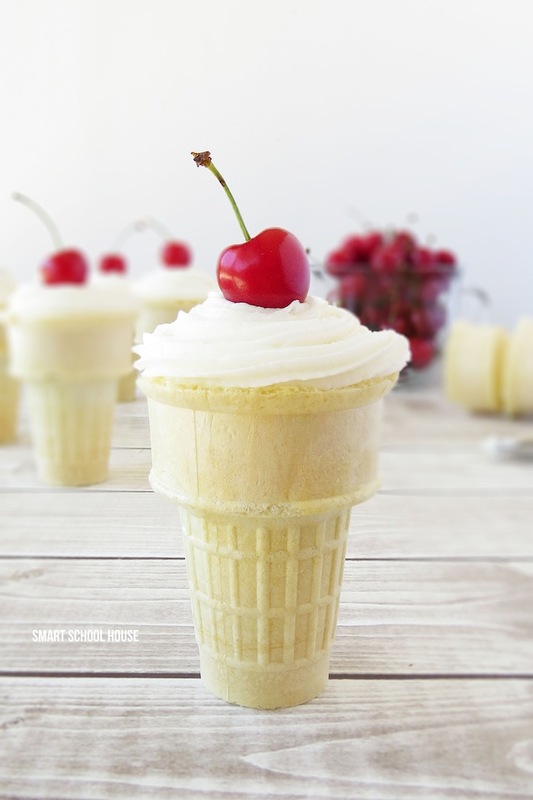 They look like an ice cream cone but they have cupcake and frosting inside. And, no, I did not bake the cupcakes inside the cones like I’ve seen done on Pinterest. That is an awesome idea, but, I’m not that talented or patient! 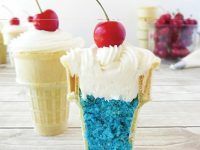 Get ready because these red, white, and blue cupcake cones are so easy that your kids can make them! <—I love that. 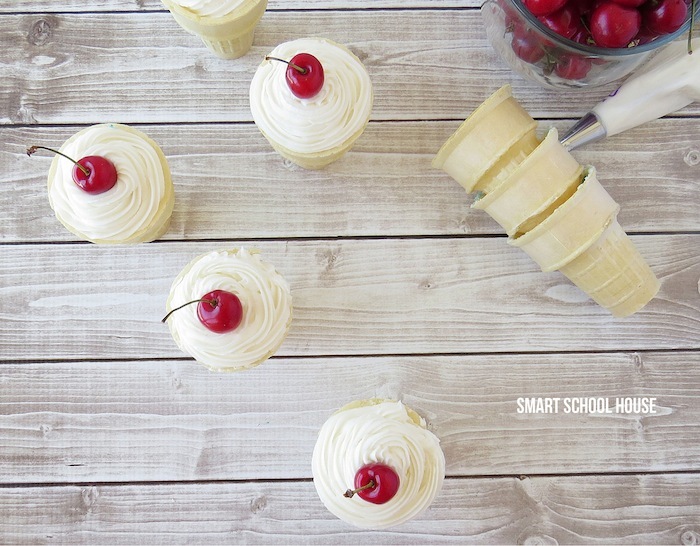 We used homemade buttercream frosting (recipe below) but I even think you could be REALLY smart and buy some pre-made white frosting if you’re short on time… aren’t well all? Add a red cherry on top and you are DONE! We picked these cherries off of our cherry tree. But, you can find cherries in the grocery stores from spring-fall. Bite in and you have yourself a glorious cupcake! Just buttercream frosting and cake. 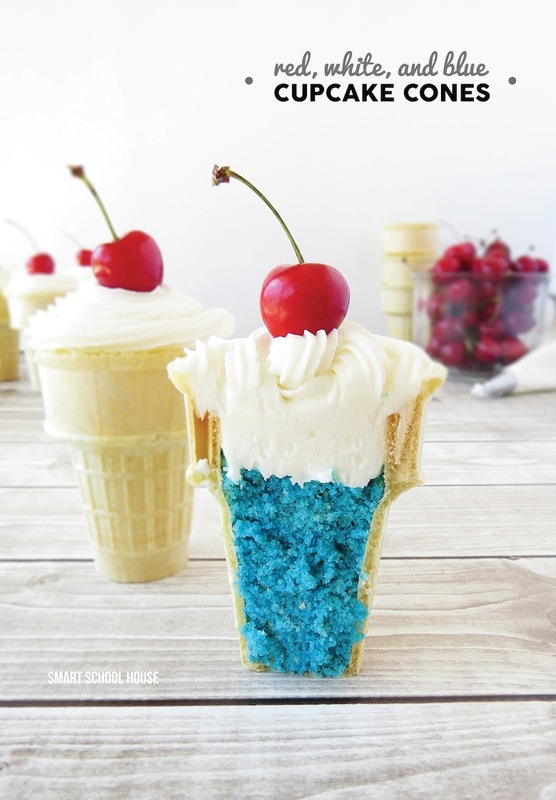 You can bet I’ll be making these for every holiday to come…..errr…my kids will be making them. Combine the softened butter with the powdered sugar with an electric mixer. Stir until combined and creamy! Bake the cake mix according to the box . Let the cake cool for about 10 minutes or so. 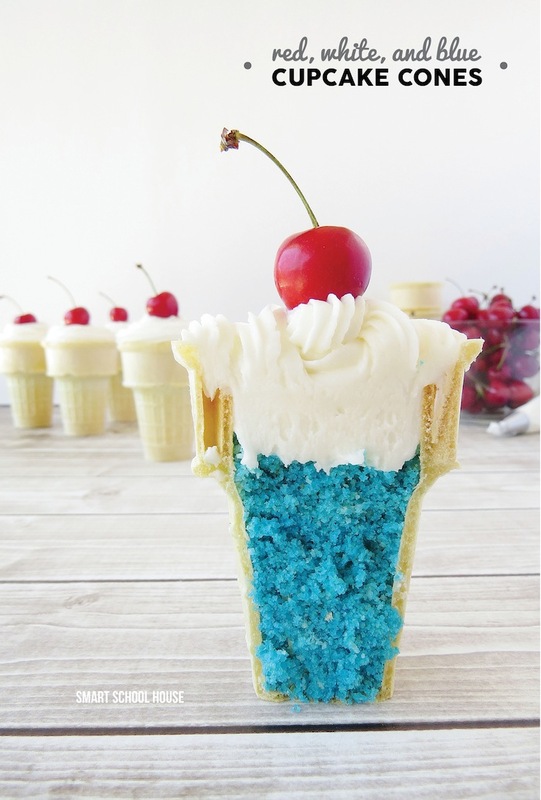 Crumble the cake up using a fork and spoon it into the ice cream cone. Using either an frosting bag with a fancy tip, or just a ziplock bag with the corner cut off, pipe the frosting onto the top of the cones. Add a red cherry on top! Does the cake crumble out when you’re eating it since it wasn’t baked in there? I’m pretty sure it would be just as easy to bake them in the cone if you just stand them in a muffin tin and fill them to the same level. Maybe easier. I don’t like the crumbly cake idea so much. Oh no, I disagree from experience. 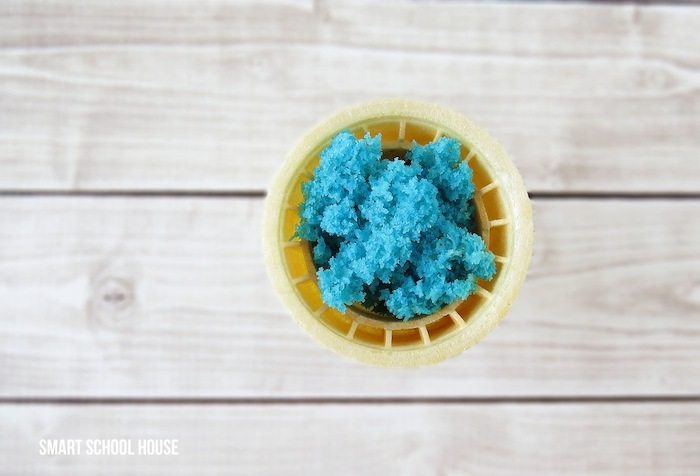 I’ve tried baking cupcakes in cones and this is way easier! Besides, these cupcakes cones are less crumbly than eating a cupcake in a paper liner (notice that the cone is more sturdy than a liner). But, since you don’t like the idea of crumbly cake, then maybe this recipe isn’t for you. Take care, Lacey! I am planning on making these for a family get together post Idepence day. While reading over your recipe my mother and I disscorved that these would be difficult to transport. Any ideas?? Hi Julia! These will melt just like a popsicle, so I would transport them in a very cold ice chest of some sort that would keep popsicles very frozen.